As promised, I’ve been lax in my blog this summer, taking the extra time to spend with my family while they are home. However, today is an important milestone in the Scoliosis Family, realistically probably the backbone (pardon the pun) of the Scoliosis Family – today is my husband Andy and my 15th Wedding Anniversary. 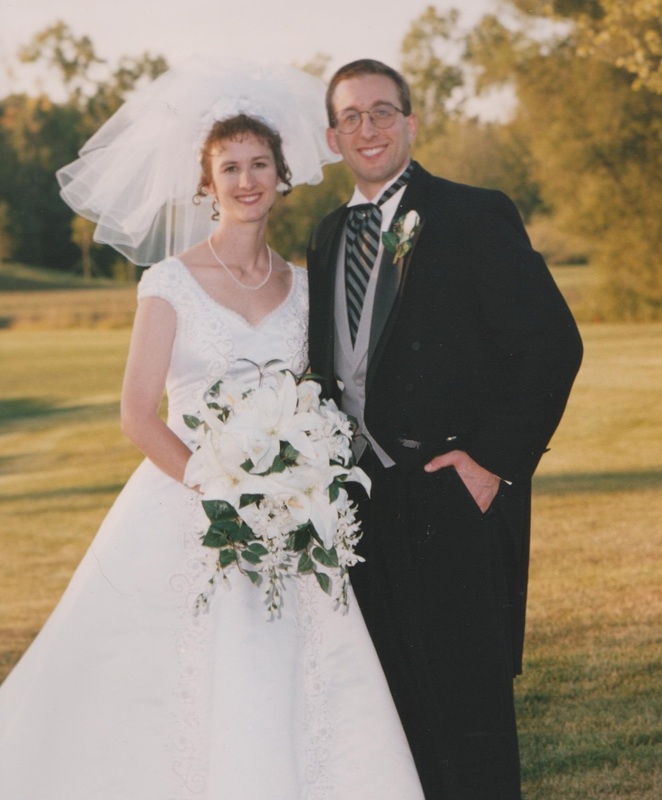 To some couples, 15 years may seem like just the start to a great marriage – some couples are blessed to head into old age with their original spouses and have 50 or more years of great memories behind them. But, to many others, 15 years is a long time. Marriage is such an odd phenomenon…most equate it with the glamorous and romantic vision of running through fields of flowers, hand-in-hand, the sun highlighting their dashing smiles as they happily prance and bask in their mutual love. But, let me tell you, that is an illusion. What most married couples will probably conjure up in their minds is a little of that romantic spark, but also will think of the hard times (and, there are ALWAYS hard times), the times you have to fight for what you have, the times when you really test what the marriage is made of. And, hopefully, when we think of marriage we think of the glorious happiness that a couple can experience when on the other side of a valley, an argument, a trial. I heard a speaker say once that every couple will go through valleys, and they have to claw their way up the other slope to get to the really great stuff – the problem is, so many couples quit when they are on that climb uphill and just miss the great stuff on the other side by a couple handfuls of dirt. Now, I won’t say that some marriages don’t end justifiably, but my point is that all marriages are hard…and wonderful. The key is to keep offering a hand to the other as you help each other out of that pit – just keep clawing your way up and helping the other when they are weak. In 15 years, it is only reasonable that we’ve clawed our way out of some valleys, but we’ve also experienced many, many peaks. My husband is a coach – a really, really good one. So, he thinks as a team player. He knows that sometimes a team member is down and you have to pick up the slack for them, that sometimes a team member is just not as strong as you are and you need to carry a heavier load, or sometimes they have an injury and can’t play, or sometimes they just need a good emotional “pump up”. And, sometimes they need to be told they are slacking and the rest of the team is suffering. We’ve been that team – first He and I (with the strength of God behind us), now our kids are part of that team, too. But, he and I are the team captains – it is our responsibility to set the example, to work the hardest, to always have our eye on the goals and lead the others. That’s us – 15 years ago today!